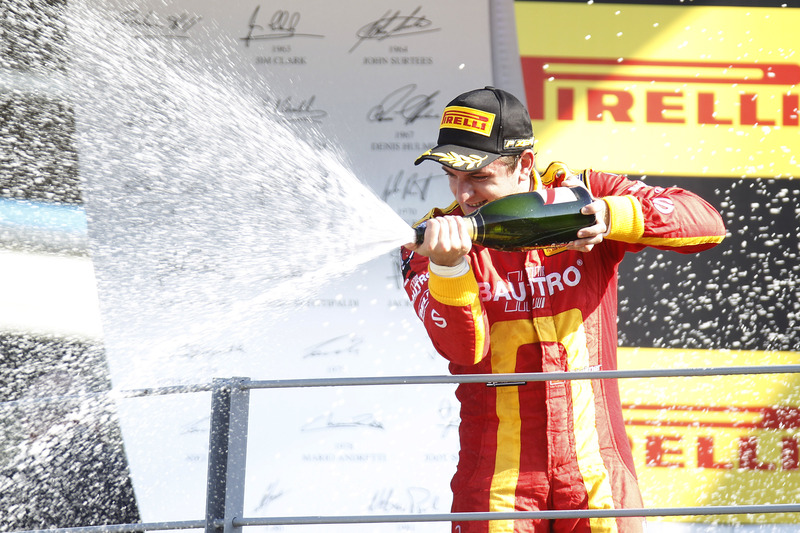 Fabio Leimer kept a charging Sam Bird at bay to win the GP2 Series Feature Race at Monza this evening. The Swiss racer jumped poleman Bird off the line to assume an early lead, until his stop for aging tyres on lap 13, allowing Bird back to the front. Building a lead of over half-a-minute, Bird ran his first set of hard tyres long, only pitting on lap 20; however a slow change of the right rear dropped the Englishman back behind his Swiss rival. From there, Leimer held a narrow lead, but Bird swept in on the Racing Engineering pilot, closing the gap 2.1s to 0.5s with three laps to go. That was as close as Bird got, as dirty air put pay to a late challenge. Strategy worked in favour for Tom Dillmann, with the Frenchman taking 3rd for RUSSIAN TIME, despite early contact with Jake Rosenzweig, which ended the latter’s race. Dillmann was shadowed by Stephane Richelmi for much of the race, but the 24-year-old maintaining the edge over his DAMS rival. Julian Leal drove another encouraging race to claim 5th ahead of James Calado – the latter of whom endured a horror start, dropping from five places to 12th off the line. The patient Calado stayed out until lap 19, maintaining solid pace and picking off spots from other drivers who stopped for a change of Pirelli’s. Adrian Quaife-Hobbs assumed 7th, recording a solid result for his Hilmer Motorsport squad, while Caterham’s Alexander Rossi finished 8th to confirm the reverse grid pole for tomorrow morning’s Sprint Race. Sergio Canamasas survived an early race battle with Johnny Cecotto Jr to claim both 9th and his first points of the year, while Vittorio Ghirelli drove a quiet, but determined race to close out the top ten, also scoring his first GP2 point of the season. It was a bad day for title contenders Stefano Coletti and Felipe Nasr – both of whom retired with suspected mechanical issues, leaving both quite a distance adrift of new championship leaders Leimer and Bird. Jolyon Palmer also retired with a loose left rear wheel, while Marcus Ericsson also failed to finish. The race only lasted one lap for Simon Trummer and Mitch Evans – both of whom collided at turn one of the second lap.